Remember those over-the-top stick figure combat animations from the early 2000s? Ever wanted them to be playable as more than an unpolished browser game? 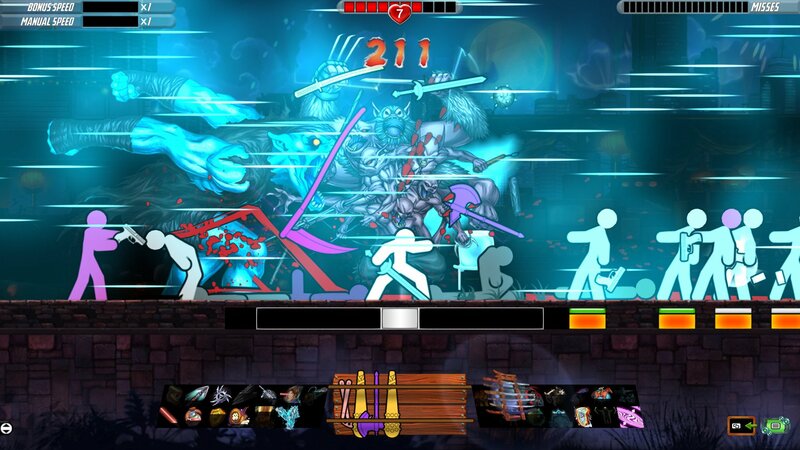 Good news: such a game exists, and it’s got a nifty two-button control scheme that makes it precise and accessible while adding a rhythm element to the beat ‘em up genre. 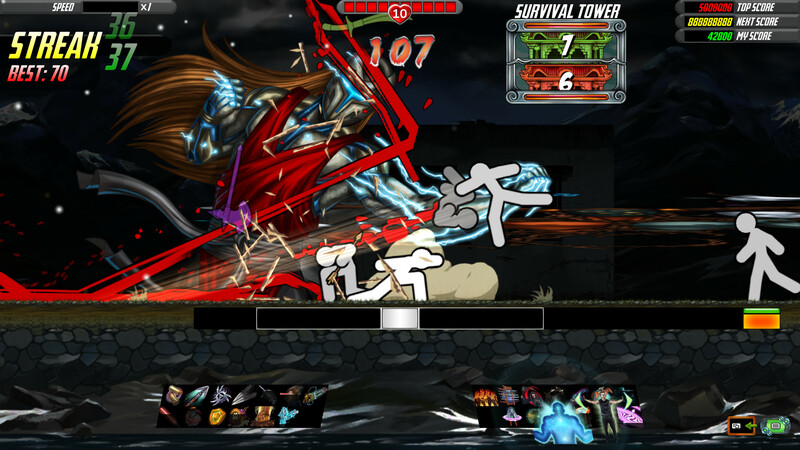 It’s called One Finger Death Punch, and it’s been available on Steam for five years. It’s a solid suggestion if you’re looking for something simple, cheap, and highly entertaining for short periods. And now, if you decide you absolutely need more of it, you can also buy One Finger Death Punch 2…or completely ignore it otherwise! While it’s still an indictment of the sequel to a degree, the “more of the same” argument here is more of an indication of how complete the original game was. From a baseline of blisteringly fast martial arts realized with highly abstracted controls, Silver Dollar Games provided surprising depth via a handful of weapons, enemy patterns, semi-randomly activated powers, and interface-obscuring extra modes. With that established, game #2 can only add a couple of minor variations to its arsenal. Two avenues I thought would be fairly obvious – new actions performed by simultaneous button presses, and a multiplayer component – are largely absent. The former has no presence whatsoever, while the latter only exists as a clever but obviously half-hearted “tag-in” survival mode. Anyone who’s played One Finger Death Punch will cite how repetitive it gets as its primary issue, and the sequel manages to be equally repetitive while also exaggerating the problem to a meta level. There are about five times as many levels in this game than there needs to be, so the occasional gameplay variant is usually buried between interchangeable standard stages. Switching modes doesn’t help, because the other options are mainly structural differences. The powers (which range from ammo upgrades, to slowing time, to screen-wide devastation) always carried the danger of ruining your planned attacking rhythm, and they still do. I understand that ordinary manual activation doesn’t fit with the overall concept, but what were the developers doing during that gap between titles if not finding alternative implementations for stuff like this? That’s the thought I keep coming back to with One Finger Death Punch 2, and it’s the reason this all probably sounds a little harsh for a game that’s still a perfectly (functional) good time. Admittedly, this premise hasn’t really been imitated and driven into the ground elsewhere, so if you haven’t played the original in a while or at all, the first couple of hours with this one should provide some solid fun. Having the game speed adjust automatically based on player performance until it reaches a state of equilibrium is an inspired approach to challenge, and the powerful, satisfying combat sounds never get old. The overall aesthetic is a blurry pastiche of wuxia and Flash games accompanied by bombastic music and nearly indecipherable carnage. On the one hand, it fully cements a unique identity for the series, but on the other, it’s difficult to appreciate the insanity while trying to play. The gameplay in One Finger Death Punch 2 starts out great. Its speed, precision, and absurdity briefly combine for some gloriously stupid fun, but the desire to keep playing drops off fairly quickly – even more so if you’ve played the original. That initial experiment succeeded, but it still left some design flaws to be improved upon. This sequel contributes nothing in that regard, and only compounds the repetition with the pervasive question of its own necessity. This review is based on the PC version of the game. A copy was provided by Silver Dollar Games.